I’ve been making my way through Snow Crash, by Neil Stephenson, this year as it keeps coming up and I finally wanted to see what all of the fuss was about. It seems to me that it might be incredible now for very different reasons than it was when it was released in 1992. I’m not finished the book as of writing this, I’m about 73% of the was through, thanks Kindle, but the parallels to the present in it are incredible and fascinating. It’s as if Hiro Protagonist is living in an alternate version of the near future, maybe even late 2016. That’s a bit of a stretch I hope, given the dystopian basis of the story, but some of the tech present in the novel has amazing parallels to 2016. The Librarian is basically Google, you can search the vastness of information online in order to do research about any topic that has someone passionate about it to write about it online. While this is an interesting idea conceived a few years before Google was founded in 1998, it also shows how things could be in the present. If the founders of Google hadn’t innovated and had instead gone the route that caused Encyclopedias to fail, their online search tool could be out of reach of almost all of us. Encyclopedias used to be the default wide angle information search tool, they had a little bit of information about most anything that someone might be researching. This brought people to the Library because the encyclopedias sets were expensive and not a financially viable option for most people to own. Google changed everything by making their money through ads rather than selling their tool directly, but we could have alternately ended up all having to go to the library in 2016 to use “The Librarian” software because we could simply not afford it as individuals. Google has been relevant for years and its almost a sure thing that someone has drawn this parallel before, but 2016 is the first relevant year of the next topic. 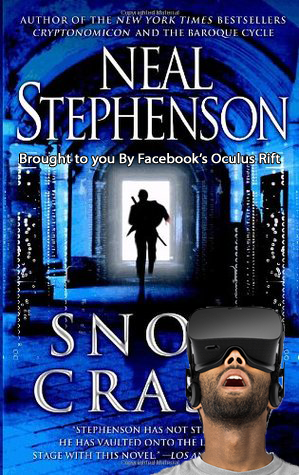 In Snow Crash, everyone stay connected through a virtual reality program called the Metaverse. This concept is the basis of an online social network, written about over a decade before MySpace or even Friendster were founded. Obviously, our current social networks have parallels to the Metaverse, but none of them are contained in virtual reality, they’re all currently websites and apps. That could change later this year when the Facebook owned Oculus Rift is released. The promise of concepts are all too real, put on your headset and you could be anywhere where a compatible camera is, or enter whatever virtual reality setting or social network emerges next. It’s been written about since Facebook’s acquisition of the virtual reality pioneering company, but this year the first production model of the Oculus Rift is being released to the public and it could become real. We could all be hanging out with virtually tailored avatars of our friends in a bar made with code, not bricks and mortar, in the next few years. One of the key ideas in the metaverse is that it is open source, and obviously Facebook is anything but, but many of Facebook’s ideas could easily echo the metaverse Neil Stephenson created. All of the hype with virtual reality is in games now, but movies and other experiences are not far behind. Court-side experiences at sporting events and a movie theater experience on your own couch are assuredly in development. Other social networks besides whatever Facebook are making are there too, we just have to wait until some developer has a polished enough idea that won’t freak people out too much decides to show off their creation.